There is nothing like a nice dip in the pool or a good swim at the beach on those hot summer days. However for those of us who suffer from swimmers ear there is little hope for those fun summer days. Actually, there was little hope until now thanks to the Ear Band-It, everyone can enjoy the beach, the pool or even a nice relaxing bath worrying. Individuals of all ages from children thru the elderly suffer from swimmers ear. Swimmers ear isn't just something that can ruin a good swim in the pool or at the beach but it can even strike strike during a simple bath! 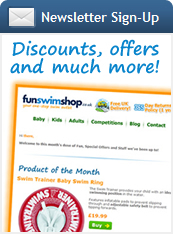 Luckily the inventors of Ear Band-It know just how unpleasant swimmers ear can be! The Ear Band-It was originally designed for children with ear tubes and quickly became available and market to everyone! 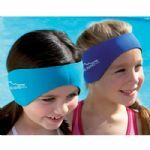 The Ear Band-It is a great solution to traditional swim "caps" and is made out of durable neoprene for a comfortable fit! 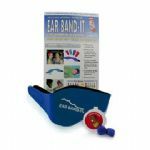 The Ear Band-It comfortably and very effectively holds ear plugs in the ear and prevents any water from entering the ear canal! Unlike uncomfortable swim "caps" the Ear Band-It does not place extra uncomfortable pressure on the ear plugs forcing the further into the ear. The Ear Band-It fits over the ear plugs and comfortable creates a waterproof seal around the ear which prevents water from entering. The Ear Band-It technology works great and never lets a drop of water through rather you are at the beach, in the pool or even in your own bath tub! This product is great for children with sensitive ears or ear tubes, teens and adults! The Ear Band-It includes a pair of ear plugs or it can be used with your own ear plugs.